Earth’s largest aquifer ecosystem resides in igneous oceanic crust, where chemosynthesis and water-rock reactions provide the carbon and energy that support an active deep biosphere. The Calvin Cycle is the predominant carbon fixation pathway in cool, oxic, crust; however, the energy and carbon metabolisms in the deep thermal basaltic aquifer are poorly understood. Anaerobic carbon fixation pathways such as the Wood-Ljungdahl pathway, which uses hydrogen (H2) and CO2, may be common in thermal aquifers since water-rock reactions can produce H2 in hydrothermal environments and bicarbonate is abundant in seawater. To test this, we reconstructed the metabolisms of eleven bacterial and archaeal metagenome-assembled genomes from an olivine biofilm obtained from a Juan de Fuca Ridge basaltic aquifer. We found that the dominant carbon fixation pathway was the Wood-Ljungdahl pathway, which was present in seven of the eight bacterial genomes. Anaerobic respiration appears to be driven by sulfate reduction, and one bacterial genome contained a complete nitrogen fixation pathway. This study reveals the potential pathways for carbon and energy flux in the deep anoxic thermal aquifer ecosystem, and suggests that ancient H2-based chemolithoautotrophy, which once dominated Earth’s early biosphere, may thus remain one of the dominant metabolisms in the suboceanic aquifer today. Raw sequence files and draft genomes are publicly available under the Bioproject Number PRJNA264811 (accession #s SDWF00000000, SESU00000000-SESZ00000000, SETA00000000-SETD00000000) on the NCBI website at https://www.ncbi.nlm.nih.gov and at https://figshare.com/articles/olivine_contig-65_fa/7252121. Orcutt BN, Bach W, Becker K, Fisher AT, Hentscher M, Toner BM, et al. Colonization of subsurface microbial observatories deployed in young ocean crust. ISME J. 2011;5:692–703. Bach W, Edwards KJ. Iron and sulfide oxidation within the basaltic ocean crust:implications for chemolithoautotrophic microbial biomass production. Geochim Cosmochim Acta. 2003;67:3871–87. Edwards KJ, Bach W, Rogers DR. Geomicrobiology of the ocean crust: a role for chemoautotrophic Fe-bacteria. Biol Bull. 2003;204:180–5. Orcutt BN, Sylvan JB, Rogers DR, Delaney J, Lee RW, Girguis PR. Carbon fixation by basalt-hosted microbial communities. Front Microbiol. 2015;6:1–14. Fisher AT, Urabe T, Klaus A. IODP expedition 301 installs three borehole crustal observatories, prepares for three-dimensional, cross-hole experiments in the northeastern Pacific Ocean. Sci Drill. 2005a;1:6–11. https://doi.org/10.2204/iodp.sd.1.01.2005, 2005. Neubeck A, Thanh Duc N, Hk Hellevang, Oze C, Bastviken D, Bacsik Z, et al. Olivine alteration and H2 production in carbonate-rich, low temperature aqueous environments. Planet Space Sci. 2014;96:51–61. Lin H-T, Cowen JP, Olson EJ, Lilley MD, Jungbluth SP, Wilson ST, et al. Dissolved hydrogen and methane in the oceanic basaltic biosphere. Earth Planet Sci Lett. 2014;405:62–73. Lever MA, Rouxel O, Alt JC, Shimizu N, Ono S, Coggon RM, et al. Evidence for microbial carbon and sulfur cycling in deeply buried ridge flank basalt. Science. 2013;339:1305–8. Nakagawa S, Inagaki F, Suzuki Y, Steinsbu BO, Lever MA, Takai K, et al. Microbial community in black rust exposed to hot ridge flank crustal fluids. Appl Environ Microbiol. 2006;72:6789–99. Pierce E, Xie G, Barabote RD, Saunders E, Han CS, Detter JC, et al. The complete genome sequence of Moorella thermoacetica (f. Clostridium thermoaceticum). Environ Microbiol. 2008;10:2550–73. Klenk H-P, Clayton RA, Tomb J-F, Dodson RJ, Gwinn M, Hickey EK, et al. The complete genome sequence of the hyperthermophilic, sulphate-reducing archaeon Archaeoglobus fulgidus. Nature. 1998;394:6342–49. Grabarse W, Mahlert F, Duin EC, Goubeaud M, Shima S, Thauer RK, et al. On the mechanism of biological methane formation: structural evidence for conformational changes in methyl-coenzyme M reductase upon substrate binding. J Mol Biol. 2001;309:315–30. Wheat CG, Jannasch HW, Fisher AT, Becker K, Sharkey J, Hulme S. Subseafloor seawater-basalt-microbe reactions: continuous sampling of borehole fluids in a ridge flank environment. Geochem Geophys Geosyst. 2020;11:1–18. Lin H-T, Cowen JP, Olson EJ, Amend JP, Lilley MD. Inorganic chemistry, gas compositions and dissolved organic carbon in fluids from sedimented young basaltic crust on the Juan de Fuca Ridge flanks. Geochim Cosmochim Acta. 2012;85:213–27. McCarthy MD, Beaupré SR, Walker BD, Voparil I, Guilderson TP, Druffel ER. Chemosynthetic origin of 14C-depleted dissolved organic matter in a ridge-flank hydrothermal system. Nat Geosci. 2010;4:32–6. Wang H, Edwards KJ. Bacterial and Archaeal DNA extracted from inoculated experiments: implication for the optimization of DNA extraction from deep-sea basalts. Geomicrobiol J. 2009;26:463–69. Reveillaud J, Reddington E, McDermott J, Algar C, Meyer JL, Sylva S, et al. Subseafloor microbial communities in hydrogen-rich vent fluids from hydrothermal systems along the Mid-Cayman Rise. Environ Microbiol. 2016;18:1970–87. Simpson JT, Durbin R. Efficient de novo assembly of large genomes using compressed data structures. Genome Res. 2012;22:549–56. Peng Y, Leung HC, Yiu SM, Chin FYL. IDBA-UD: A de novo assembler for single-cell and metagenomic sequencing data with highly uneven depth. Bioinformatics. 2012;28:1420–28. Parks DH, Imelfort M, Skennerton CT, Hugenholtz P, Tyson GW. CheckM: assessing the quality of microbial genomes recovered from isolates, single cells, and metagenomes. Genome Res. 2015;25:1043–55. Ragsdale SW, Pierce E. Acetogenesis and the Wood-Ljungdahl pathway of CO2 fixation. Biochim Biophys Acta - Proteins Proteom. 2008;1784:1873–98. Slobodkina GB, Kolganova TV, Querellou J, Bonch-Osmolovskaya EA, Slobodkin AI. Geoglobus acetivorans sp. nov., an iron(III)-reducing archaeon from a deep-sea hydrothermal vent. Int J Syst Evol Microbiol. 2009;59(Pt 11):2880–3. McAllister, SM, Moore RM, Gartman A, Luther GW III, Emerson D, Chan CS Marine Fe-oxidizing Zetaproteobacteria: historical, ecological, and genomic perspectives. bioRxivorg 2018;416842. https://doi.org/10.1101/416842. Steinsbu BO, Thorseth IH, Nakagawa S, Inagaki F, Lever MA, Engelen B, et al. Archaeoglobus sulfaticallidus sp. nov., a thermophilic and facultatively lithoautotrophic sulfate-reducer isolated from black rust exposed to hot ridge flank crustal fluids. Int J Syst Evol Microbiol. 2010;60(Pt 12):2745–52. Hugenholtz P, Pitulle C, Hershberger KL, Pace NR. 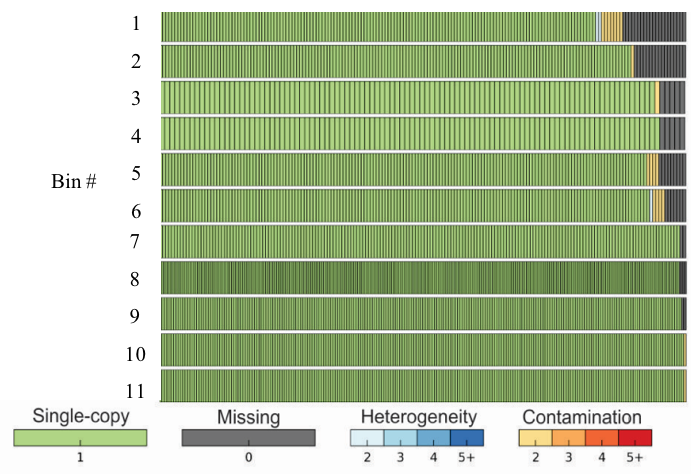 Novel division level bacterial diversity in a Yellowstone hot spring. J Bacteriol. 1998;180:366–76. Rinke C, Schwientek P, Sczyrba A, Ivanova NN, Anderson IJ, Cheng J-F, et al. Insights into the phylogeny and coding potential of microbial dark matter. Nature. 2013;499:431–7. Takami H, Noguchi H, Takaki Y, Uchiyama I, Toyoda A, Nishi S, et al. A deeply branching thermophilic bacterium with an ancient acetyl-CoA pathway dominates a subsurface ecosystem. PLoS One. 2012. https://doi.org/10.1371/journal.pone.0030559. Magnabosco C, Ryan K, Lau MC, Kuloyo O, Sherwood Lollar B, Kieft TL, et al. A metagenomic window into carbon metabolism at 3 km depth in Precambrian continental crust. ISME J. 2015;10:730–41. Maupin-Furlow JA, Ferry JG. Analysis of the CO dehydrogenase/acetyl-coenzyme A synthase operon of Methanosarcina thermophila. J Bacteriol. 1996;178:6849–56. Robador A, Jungbluth SP, LaRowe DE, Bowers RM, Rappé MS, Amend JP, et al. Activity and phylogenetic diversity of sulfate-reducing microorganisms in low-temperature subsurface fluids within the upper oceanic crust. Front Microbiol. 2015. https://doi.org/10.3389/fmicb.2014.00748. Boyd ES, Schut GJ, Adams MWW, Peters JW. Hydrogen metabolism and the evolution of biological respiration. Microbe . 2014;9:361–7. Peters JW, Schut GJ, Boyd ES, Mulder DW, Shepard EM, Broderick JB, et al. [FeFe]- and [NiFe]-hydrogenase diversity, mechanism, and maturation. Biochim Biophys Acta. 2015;1853:1350–69. Vignais PM, Billoud B. Occurrence, classification, and biological function of hydrogenases : an overview. Chem Rev. 2007;107:4206–72. Schuchmann K, Müller V. Autotrophy at the thermodynamic limit of life: a model for energy conservation in acetogenic bacteria. Nat Rev Microbiol. 2014;12:809–21. Sanders C, Turkarslan S, Lee DW, Daldal F. Cytochrome c biogenesis: the Ccm system. Trends Microbiol. 2010;18:266–74. Lever MA. Acetogenesis in the energy-starved deep biosphere-a paradox? Front Microbiol. 2012;2:284. https://doi.org/10.3389/fmicb.2011.00284. Metagenome sequencing was made possible by the Deep Carbon Observatory Census of Deep Life supported by the Alfred P. Sloan Foundation and was performed at the Marine Biological Laboratory (Woods Hole, MA, USA). We are grateful for the assistance of Mitch Sogin, Susan Huse, Joseph Vineis, Andrew Voorhis, Sharon Grim, and Hilary Morrison at MBL. Andrew Fisher, C. Geoffrey Wheat, Hans Jannasch, Stefan Sievert, Keir Becker, Mark Nielsen, and the crews of submersible DSRV Alvin and the R/V Atlantis and D/V JOIDES Resolution assisted with flow cell development, deployment, and retrieval. William Rugh contributed to the design of the flow cells. This is a Center for Dark Energy Biosphere Investigations (C-DEBI) contribution. Correspondence to Amy R. Smith.